The Necronomicon has been stolen, a Farm is undergoing a horrifying Metamorphosis, and abominations stir in Penguin-riddles Tombs beneath the ice. Will your curiosity lead you to Inevitable Doom, or are you actually a Secret Cultist? 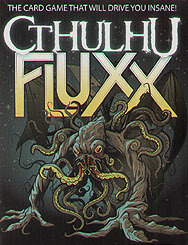 Gaze upon the ever-changing face of Madness with Cthulhu Fluxx.